My plane connections Thursday were in Atlanta, and there were quilters on that flight. One was Shelley Kirk, whom I met again at breakfast on Friday, and we tackled the Festival together. 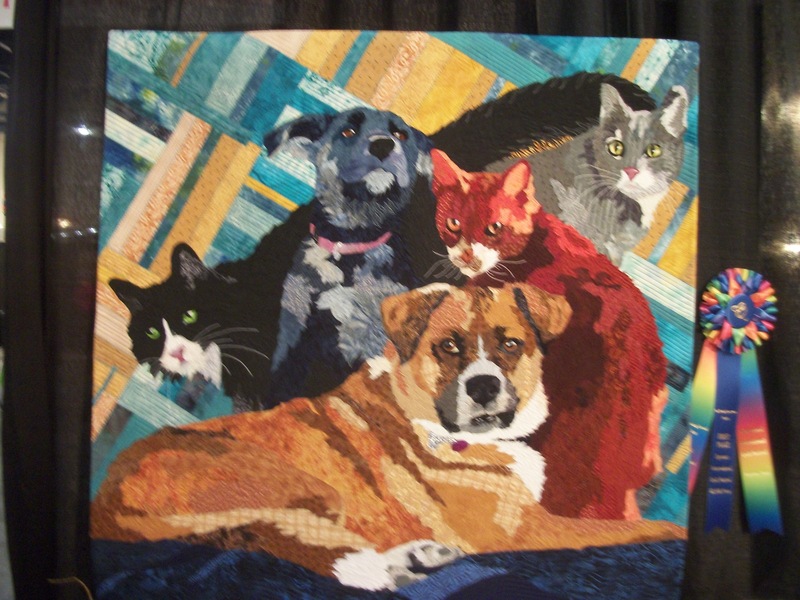 Shelley is from coastal North Carolina, the Cape Fear/Wilmington area, and is a new quilter. This show is her FIRST big show. Of course I did–it was of a rooster. 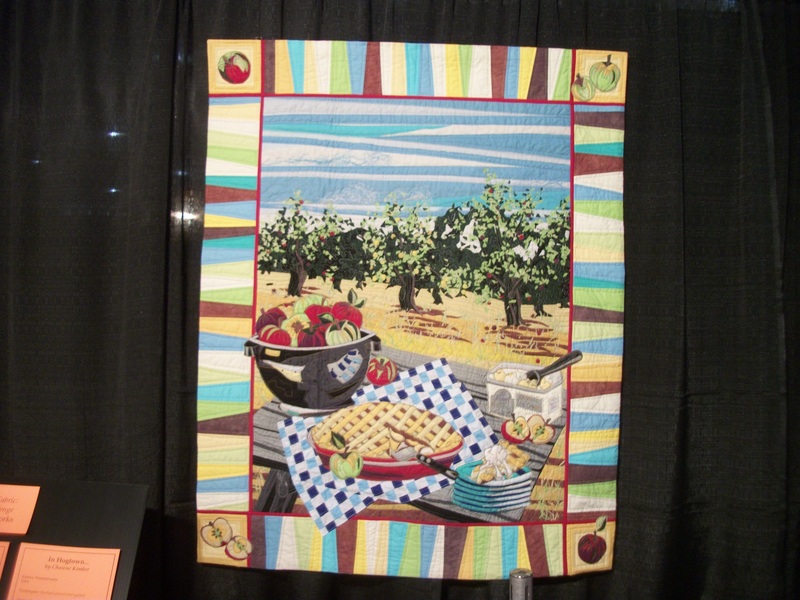 (This quilt is copyrighted, so I could not take a picture.) 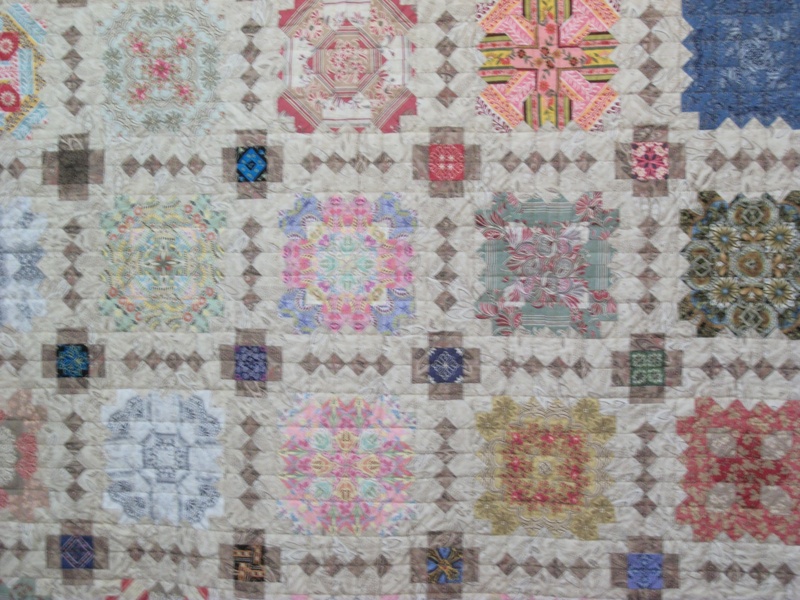 Olga is from the old Russian city of Kovrov, and I could not find an on-line picture of this very special quilt. Alex Andersen and Ricky Tims of The Quilt Show have a booth, and Shelley and I met Victoria Findlay Wolfe demonstrating her newest quilts. Victoria’s first book is a delight: 15 MINUTES OF PLAY. Since then, she’s been making innovative wedding ring quilts (some of which we saw), and that book will come out in January. The table they were using had a white covering with names of people that have been on the show. I saw one of our local quilter’s names among the rest: Dianne Hire. That was a fun moment. 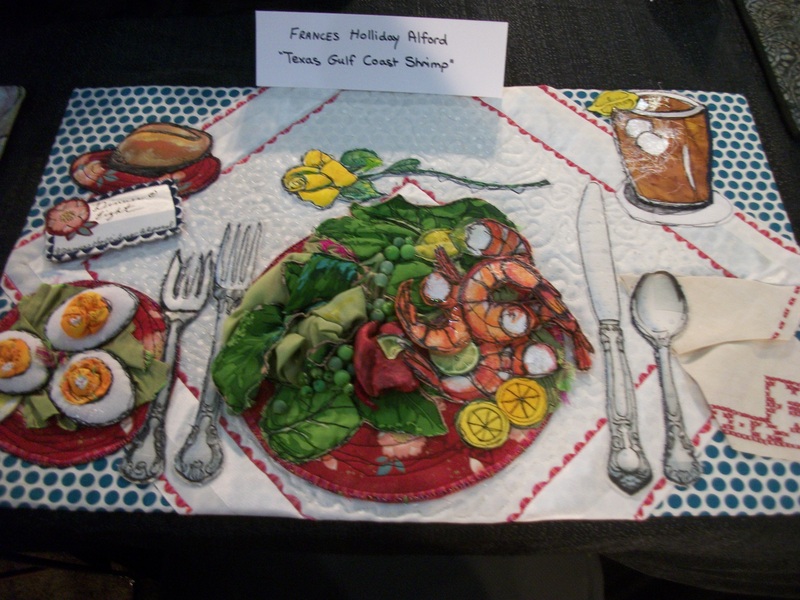 We also saw Eleanor Burns at The Quilt Show booth (Quilt in a Day quilts) and later at her own booth. And it’s always fun to see Deb Tucker of the “rapid fire” templates. She is so amazing. 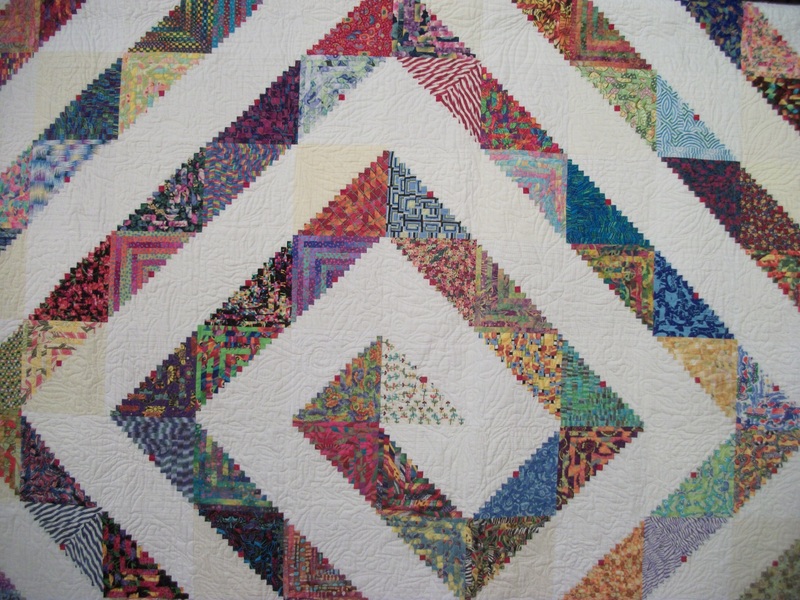 The quilts in her “Studio 180 Design” are so interesting, colorful, and beautifully quilted. Then we went to The Grove for a late afternoon meal and back to the quilt show for about an hour. After walking about five hours, I was tired and settled into my wonderful room for the evening. Shelley took classes all day, and I walked all day. It took me about three hours to see the rest of the quilts. And that didn’t include stopping to admire each one separately. There were so many… And so many that were so beautiful. 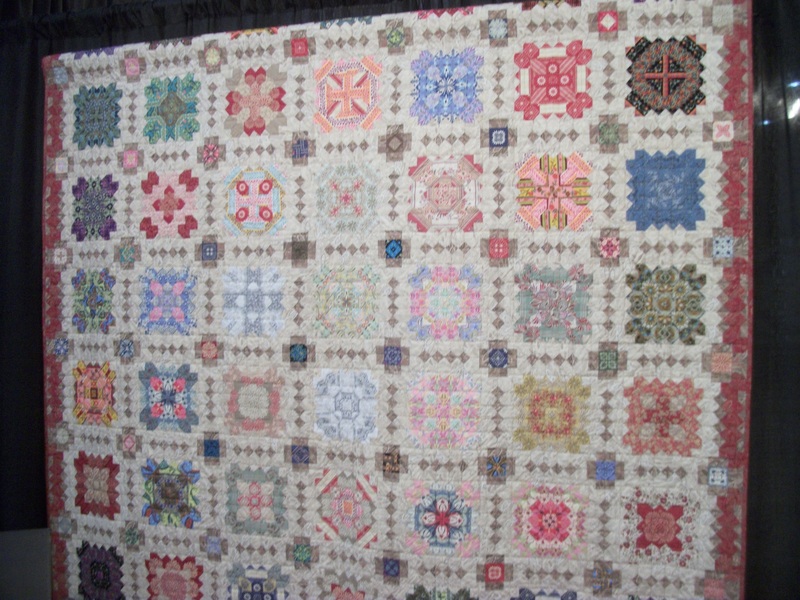 Here are a few favorites–though I could have taken pictures of every single quilt there. Sometimes I take pictures so that I remember something about the technique in a quilt, and I’m afraid that’s what I mostly brought home in terms of pictures. When NASA Astronaut Karen Nyberg was on board the International Space Station, she made a quilt block. 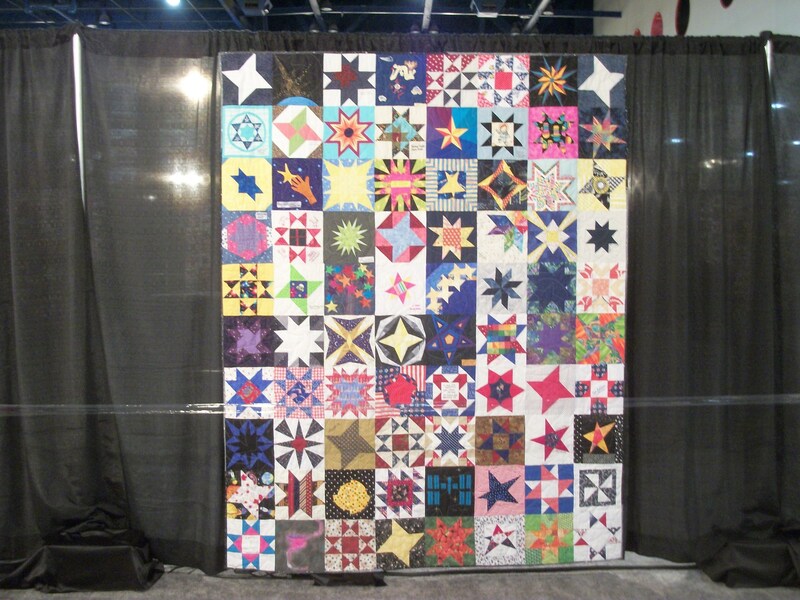 Her block pattern was combined with star-themed blocks made by quilters from all over the world. The blocks were sewn into quilts that look like this one and displayed in this exhibit: ASTRONOMICAL QUILTS! BLOCK CHALLENGE. 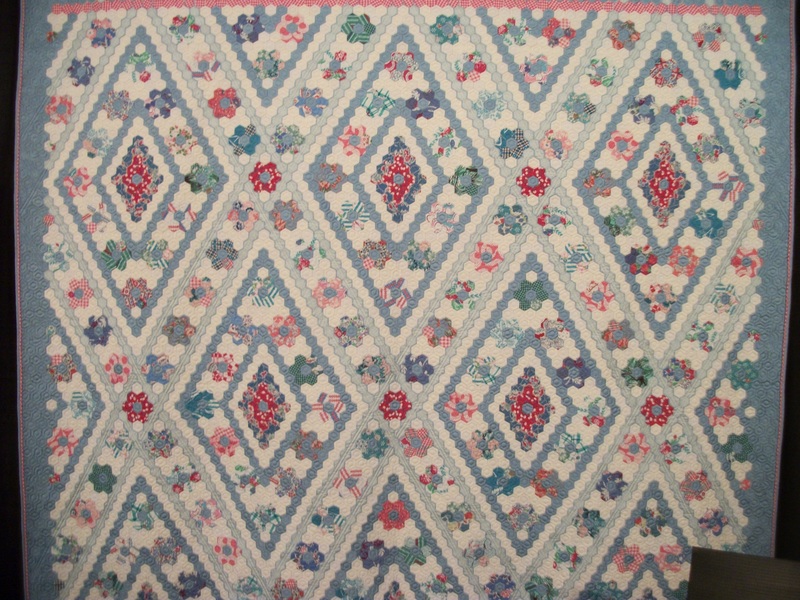 There were about a dozen of these quilts. And, isn’t this whole idea just so…quilty? In the exhibit WHAT’S FOR DINNER, 3-D dinners were exhibited, each on its own placemat. They were so much fun! Of course I fell in love with the exhibit IT’S RAINING CATS AND DOGS. 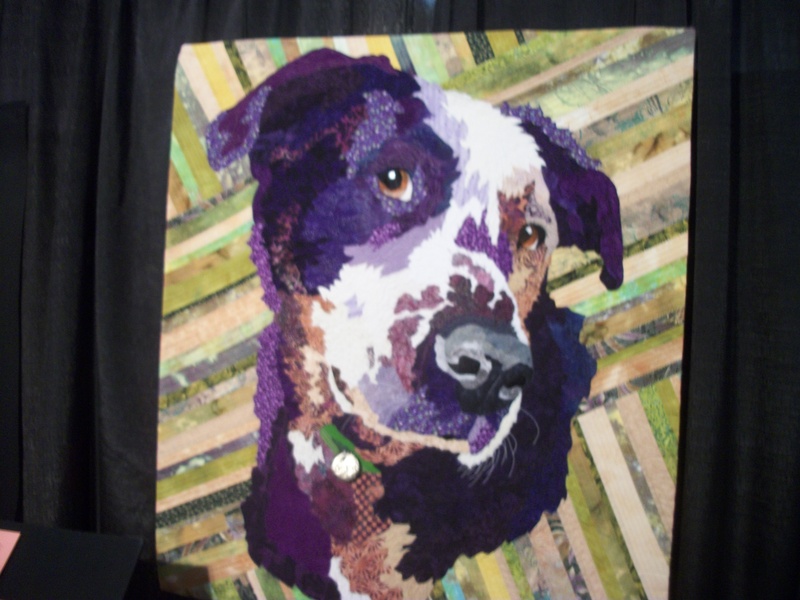 And, also, Beasley’s “Can We Talk About the Steak?” Don’t you love her use of purple and green? I have been drawn, for some time, to different color variations of one image. 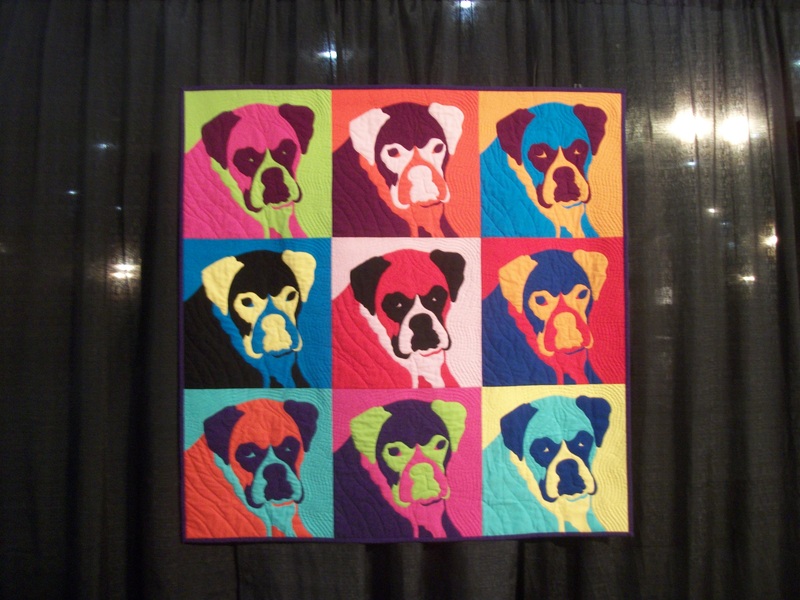 Here’s Deborah Yates’s “A Warhol Zakoosa”–Zakoosa is her dog, a boxer. Here’s a Lucy Boston variation by Suet-Fern Lee of Singapore. This block is pieced as an elongated hexie, called a honeycomb. I am playing around with this block piece as well, but with bright fabrics. I’m using pre-made paper pieces to make it. The blocks are linked together with an assortment of different shapes, including the tiny squares you see here. Here’s a very different use of the New York Beauty block by Carol Anne Ludington. I LOVE the New York Beauty block. Here’s “As American As…” by Laura Fogg, shown in an exhibit highlighting American-made fabrics which are, for the moment, all solids. 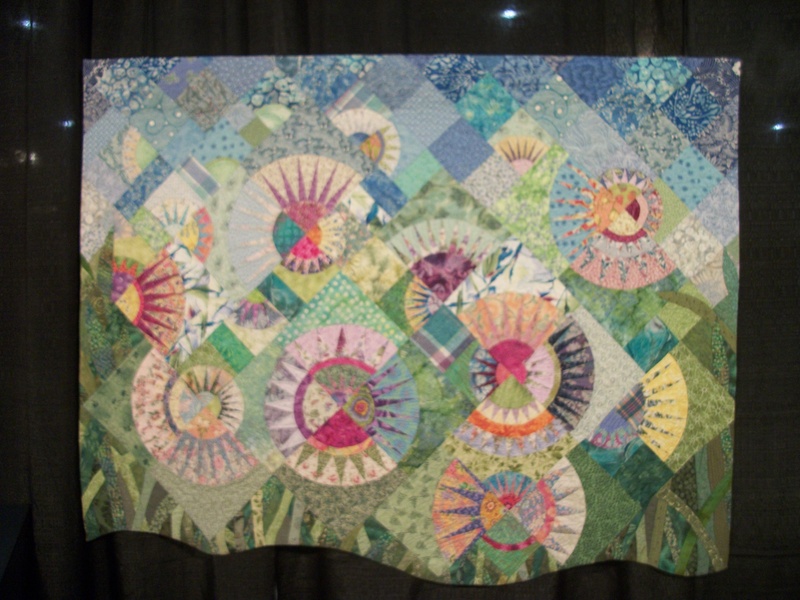 Here’s a gorgeous hexie quilt by Miyuki Hamaba Sanda of Japan. 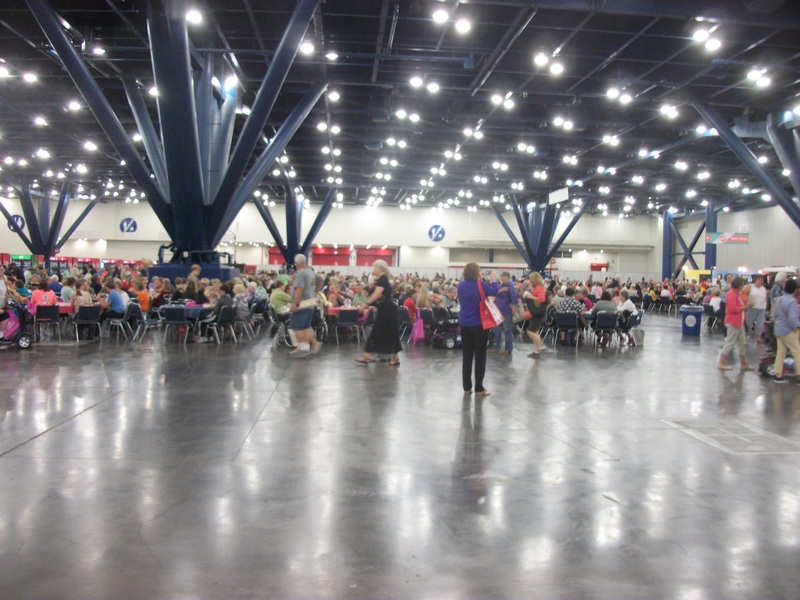 I took a break after the quilts in the food court–which was HUGE. The camera could not take in the whole thing. This is about a third of it. 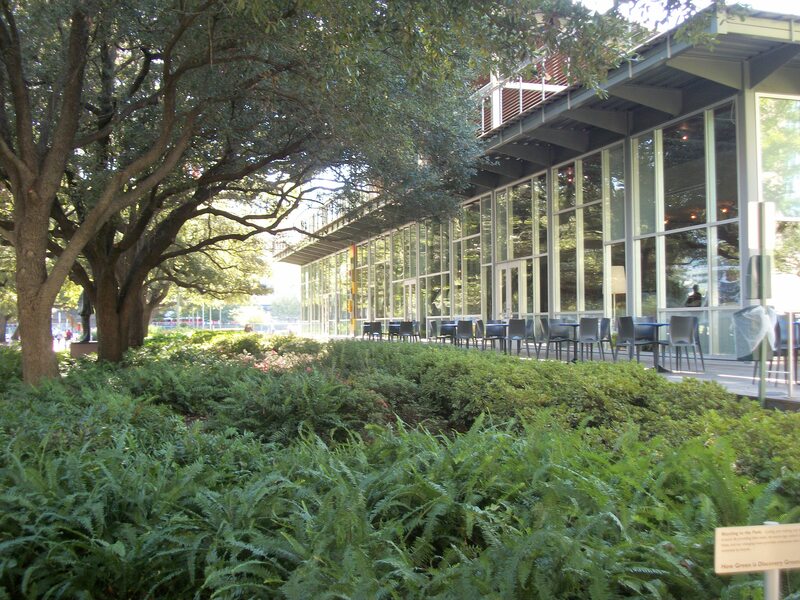 I sat with a coffee for a while with a group of four women from the Houston area. They were gracious and funny and it was a delight to visit with them for a bit. Then I tackled the other half of the vendors. 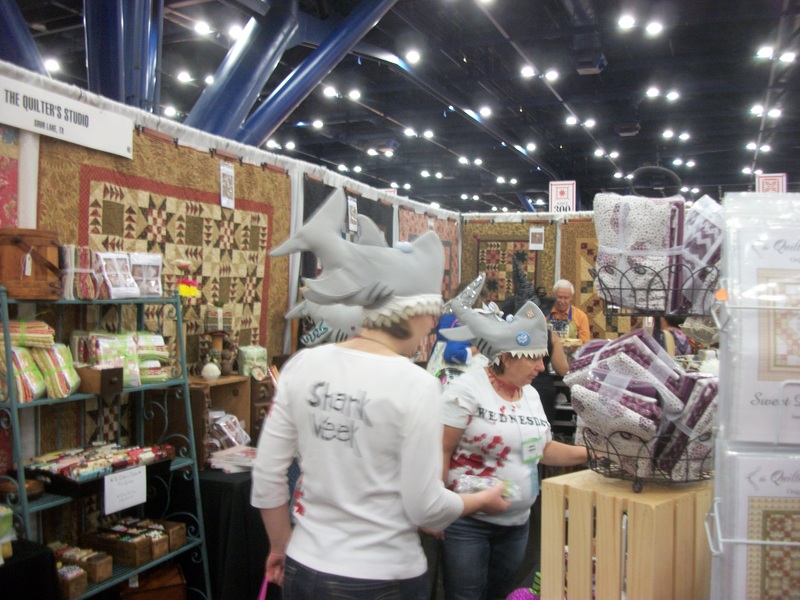 I kept running into this group of women with shark hats. I found two patterns for little girl short skirts, a special ruler with a rotary cutter attached that does not slide away from you when you cut, the two log cabin rulers I wanted (I’m long cabin mad at the moment), a plastic widget that sews curves when attached to your machine, and some chicken fabric for a new bow-tie purse as my current one is wearing out. 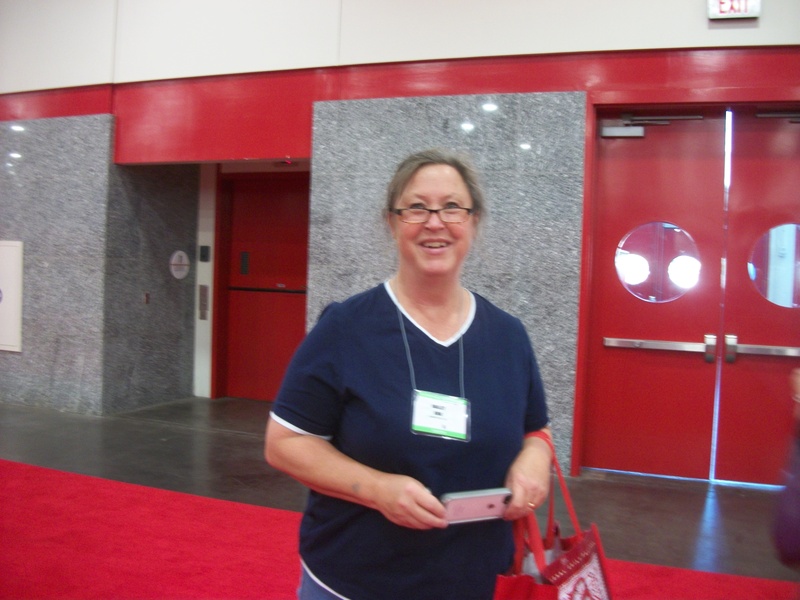 Bonnie Hunter posted pictures from her quick visit to the show before going to Galveston for a cruise. She saw Edyta Sitar–one of my favorite quilters–and I did not realize that Edyta and her Laundry Basket Quilts had a booth. I sought her out, had a lovely visit with her, which included her telling me about seeing Bonnie. I bought her newest book, HANDFULS OF SCRAPS. She GAVE ME two of her journals, one for me and one for my local quilt group, Coastal Quilters. 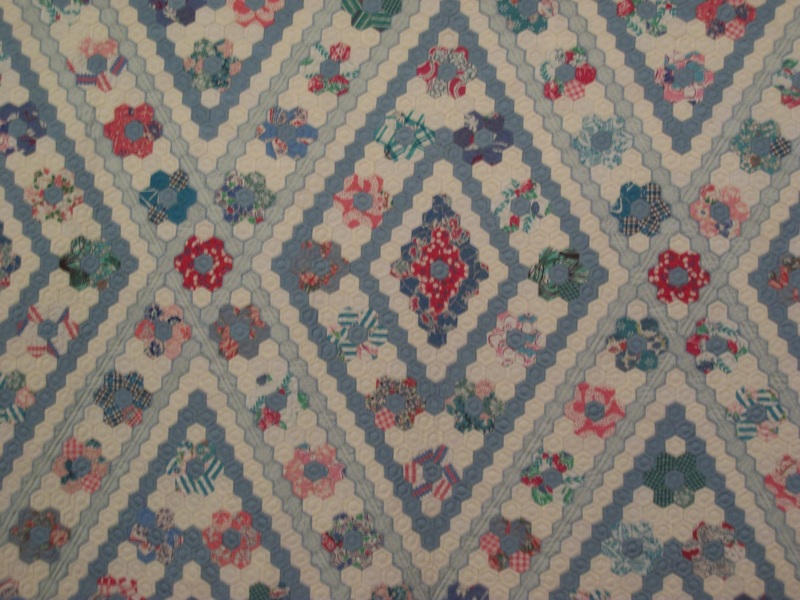 The new book has a gorgeous hexie quilt pattern that I will likely make my winter hand sewing project. Best of all, I saw many of her beautiful, beautiful quilts up close and personal. There was one especially that is haunting me and for which I may have to order the pattern. Edyta, like Bonnie Hunter, likes complicated quilts with small pieces. But they use entirely different color arrangements, and Edyta does a lot with very innovative and gorgeous applique borders. I might have the courage to try one of these borders if I do the hexie quilt. My only problem is going to be choosing which color scheme to use: Edyta’s rich warm colors or brighter contemporary colors. So, I quit about 2:00 p.m., too tired and too overwhelmed to see or think about another thing. I got a coffee at Phoenicia foods and sat around the Four Seasons pool and read Edyta’s book–and tried not to think about the blizzard raging back in Maine. Dinner will be a salad from Phoenicia as well. And, the maid changed the room’s clock for me so I will wake up on time now for my 5:30 a.m. pick-up. It’s been a fun and enriching trip, but I am wild to go home and sew, sew, sew.